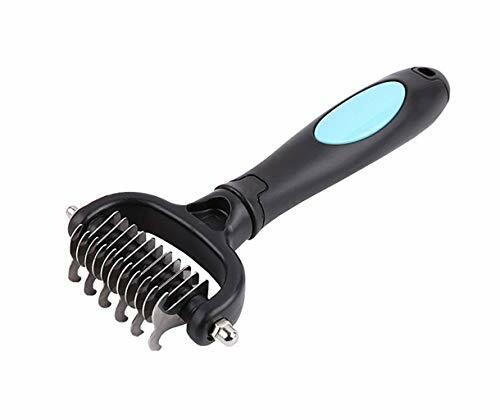 Double-edged double-edged, sparse and dense teeth 2 in 1, according to the degree of hair knotted to select the tooth surface, easily cut hair knots, supple hair, and more quickly professional removal of hair knots and pet grooming. Handshake comfort - Soft ergonomic anti-slip grip makes regular grooming easy and effortless.Stainless steel teeth are extremely durable and easy to clean. Frequently use the beauty to knot the comb to easily remove the dead hair of the pet and reduce the flying hair and it also can improve skin resistance and relieve fatigue. Our sharp,but safety edges cut through the toughest matted hair, Designed to penetrate into the coat and will not damage or scratch your pet's skin. Comfort-Grip and Anti-Slip Handle Prevents Wrist Strain No Matter How Long You Comb Your Pet.